He’s famous for Harold and the Purple Crayon (1955) and the comic strip Barnaby (1942-1952), but Crockett Johnson wrote an earlier strip — one that was popular enough to feature in a series of Ford advertisements in the late 1940s. 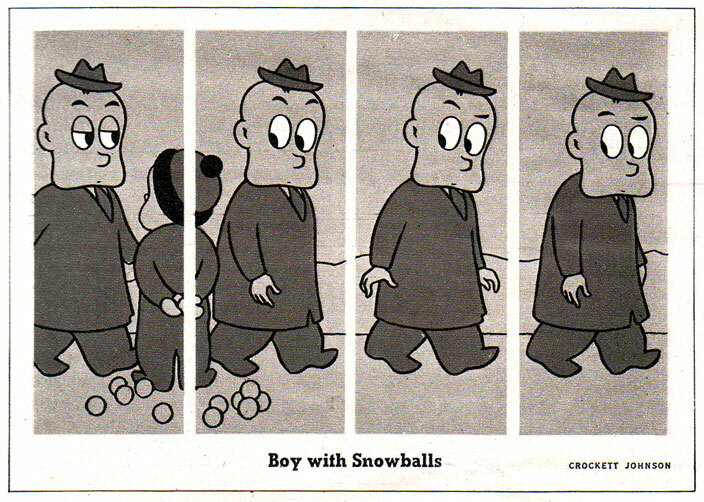 Popularly known as The Little Man with the Eyes, Johnson’s strip ran in Collier’s from March of 1940 to January of 1943. As Eric Reynolds and I work on co-editing The Complete Barnaby for Fantagraphics (designed by Daniel Clowes! ), I’ve been looking through Collier’s, selecting a few Little Man strips for inclusion in the first Barnaby volume (April 2012). Along with the first two years of Barnaby (1942-1943), the book will include a small taste of Crockett Johnson “ephemera,” such as early work, photographs, advertisements. 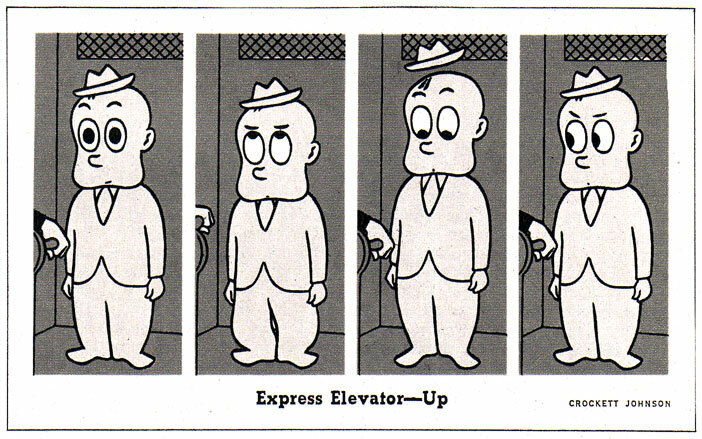 Here a few Little Man strips that might end up in the Complete Barnaby, vol. 1. As you can see, it’s a very subtle strip, relying upon slight changes in the Little Man’s eyes and posture to register the joke. Its subtlety confirms my impression that Johnson must have been influenced by Otto Soglow, whose The Little King made its debut in the early 1930s. I also suspect that the strip may be a little too nuanced for the general reader. In addition to both preceding Barnaby and running concurrently with it for eight months, the Little Man has one other reason for inclusion in The Complete Barnaby, vol. 1: the book likely represents its sole chance to reappear in print. (I also include one Little Man strip in The Purple Crayon and a Hole to Dig: The Lives of Crockett Johnson and Ruth Krauss, forthcoming April 2012.) I hope I’m wrong about that — I would love it if Fantagraphics or Drawn & Quarterly or [insert name of publisher here] wanted to pursue a Little Man with the Eyes collection, …as perhaps you might intuit from the fact that I’ve collected vintage Collier’s magazines for the sole reason of getting copies of Johnson’s strip. Above, the strip that ran in Collier’s on December 6, 1941 — the day before Pearl Harbor. 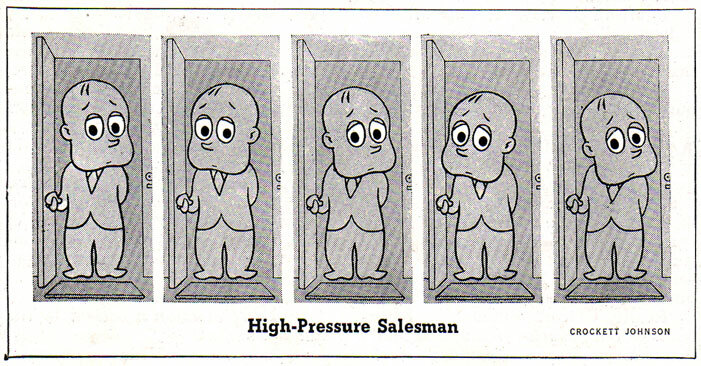 Unlike Johnson’s New Masses cartoons (1934-1940) and Barnaby, the Little Man was an apolitical strip. During the war, Johnson’s comic did occasionally register world events, as in the strip below. 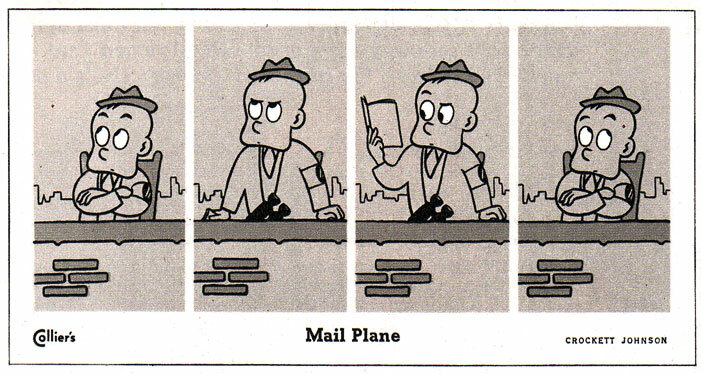 That said, even though the above strip is topical, its focus is the Little Man‘s initial mis-identification of the plane — and not, say, Hitler or Isolationist politicians. Johnson did do some political cartoons both prior to and during Barnaby (itself a political strip), but the Little Man was a more gentle figure. Indeed, save for his diminutive stature, the Little Man was rather like Johnson himself. Happy π Day from Crockett Johnson. One of Johnson’s geometrical paintings, and an original mathematical formula. Very interesting post. Ernie Kovacs did a bit from time to time on his TV shows in the mid-1950s that he called “Oblicatures”, which is reminiscent of this strp. Kovacs’ “Oblicatures” were each a single panel — shown on camera — of three or four pairs of eyes (just the eyes, nothing else) with a corresponding caption below, which Kovacs would read. Phil- How many of these strips are there in total anyway? “January 2, 1942.” 9 Jan. 1943. This really, really, REALLY should be a book. Well, if we want to make this happen, the first step should be collecting Collier’s magazines — and asking Johnson fans who may already have issues themselves (Chris Ware, Dan Clowes). I have photocopies of all strips, but we want the originals. Of the published versions, I have about thirty, including the 13 in Collier’s Collects Its Wits (Harcourt, Brace and Company, 1941), and the ones in Collier’s of 6 April 1940, 27 April 1940, 4 May 1940, 25 May 1940, 8 June 1940, 6 July 1940, 13 July 1940, 10 Aug. 1940, 14 Sept. 1940, 25 Jan. 1941, 22 Feb. 1941, 5 April 1941, 17 May 1941, 31 May 1941, 14 June 1941, 20 Sept. 1941, 6 Dec. 1941, 3 Jan. 1942, 25 April 1942, 13 June 1942, 18 July 1942, 25 July 1942, and 3 Oct. 1942. So, what do you think? We could collect the strips & co-edit the volume. If we can’t find a publisher, we could try funding it using Kickstarter. Count me in! I’ll check what issues I have. I assume no originals or proof sheets exist in the estate? Cool! Regarding originals: not that I know of. In Johnson’s papers (Smithsonian) is his scrapbook, which contains all 132 of them — or nearly all. However, he pasted them in the scrapbook, and the glue has seeped through & damaged them. The other issue here, of course, is that one would have to pay the Smithsonian for the scans. Having said that, I think the scrapbook might serve as a back-up. If we cannot locate a strip, then perhaps we could rehabilitate one of the glue-damaged strips. Looking forward to your book Phil. Great to see these strips. Wow, Phil–I’m loving these comic strips. It’s as if Crockett Johnson asked, “What is the most economical way to tell a story?” When you pitch your Little Man collection, tell publishers that I’ll buy one. I’m what you call a built-in audience. Thanks, Jonathan and Alvin. It is indeed the most economical way to tell a story. I think that’s one reason Mark Newgarden likes it so much. Check out his & Megan Montague Cash’s Bow-Wow Bugs a Bug (picture book), or its board-book offspring (Bow-Wow Attracts Opposites, Bow-Wow Orders Lunch,…). But, yes, the “Little Man” strips succinctly embodies Johnson’s minimalist aesthetic — also on display in Harold and the Purple Crayon (Harold draws only what the story needs, nothing more), and, really, throughout his work.